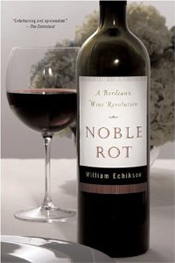 Noble Rot by William Echikson brings together several different storylines concerning the immediate and distant past of the Bordeaux wine region. While the title refers to the rot that produces the great Sauternes wines, the history of D’Yquem is only one minor tale within the story. It is this tale however that is the best told with its family feuding and backstabbing producing the material an engaging story is easily drawn from. The remainder of this wine book focuses on different storylines told through local characters. There are the merchants who search out new wines to bring to the market, the peasant farmers trying to make a living through bulk Bordeaux Superior wines, the Garagistes breaking the rules of traditional Bordeaux and of course the maker and breaker of vintages, Robert M. Parker. Several of the stories are interesting and give the reader a sense of the upheaval experienced in the region over the past ten years. However, a few of the stories become boring and monotonous as they go into great detail. The organization of the book is also difficult to follow as the author jumps between subjects between and even within chapters. We sometimes found ourselves confusing the different characters and needing to go back a few chapters to remember why they were being featured in the book. Overall it’s an interesting wine book, but definitely takes some effort to stay involved in the less interesting and more confusing sections.